20140507 - Up and to a conference room at OSU for the day with Eric, Dave, Mike & Tim. 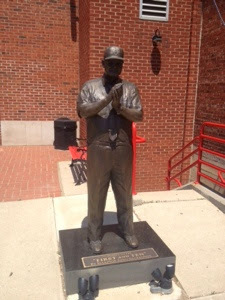 It was and all day meeting... We took a break and walked to the Varsity Club for lunch and got a picture of Woody Hayes, back to the room for more meetings and then dinner in the Short North. Home about 9pm to hear about the boy's days, D went to the dentist (no cavities :-) and had baseball practice with his rec team, J&G played outside. Put the boys to bed, talked to L, she got a new bank accout today and was in and out of the house 6 times running errands today. I stayed up a bit to do some work at the desk.